DC Office, Dibrugarh Recruitment 2018 August – Data Entry Operator Posts :- Office of the Deputy Commissioner Dibrugarh has published a recruitment 2018 notification in the month of August. According to the Latest DC Office Dibrugarh Recruitment 2018 August Application as published in Part IX of Assam Gazette who are the citizens of India as defined in Article 5 to 8 of the Constitution of India for filling up the following vacancies (sanctioned posts) of Data Entry Operator in the office of the Deputy Commissioner as District Election Officer, Dibrugarh. We have given full details about this recruitment below. Check it out !! 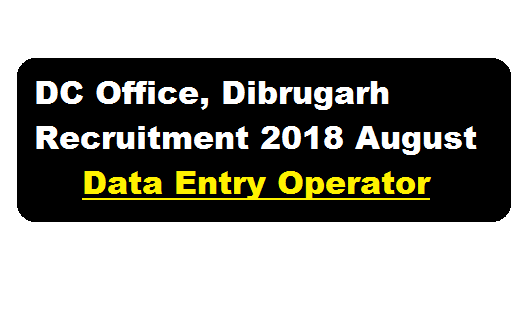 In this section, we will discuss in detail about Recruitment of Data Entry Operator Posts under DC Office, Dibrugarh Recruitment 2018 August with all the details and requirement. Salary: Rs. 14000- 49000 plus Grade Pay of Rs.5600 and other allowances as admissible under the Rules. Diploma holders from Polytechnic with minimum 60% marks in aggregate or equivalent grade from an UGC/ AICTE approved/ recognized Institution in Computer Science/ Computer Engineering/ Electronics/ Telecommunications Engineering/ Information Technology. Desirable condition: Candidate must have the typing speed of not less than 8000 key depressions per hour. A certificate of typing/ Skill test is needed. Age Limit: Candidates must not be less than 18 years and more than 43 years of age as on 01/07/2018. Upper age limit is relaxed by 5 years in case of ST/SC candidates as per Govt. OM No. ABP 06/2016/04, Dated 3rd March’ 2016. Applications should be sent through post or delivered by hand to the Deputy Commissioner, Dibrugarh, P.O. – C.R. Building, PIN – 786003, Dist. – Dibrugarh, Assam. Post applied for shall be super-scripted on the sealed envelope. a. HSLC Admit Card (age proof), Pass Certificate and Mark sheet. b. HSSLC Pass Certificate and Mark sheet. c. Degree Pass Certificate and Mark sheet. f. Caste Certificate if applicable. h. BPL F.l. Card copy if available.